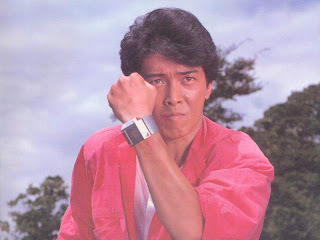 While watching Changeman, I thought of who my favorite would be. I thought I could relate more to Yuuma Oozora or to Shou Hayate but I ended up picking Hiryu Tsurugi. Yes, Hiryu and the actor Haruki Hamada together with the suit actor Kazuo Niibori (who I never knew until Akibaranger) do a good job portraying the character. So what's up with him as the leader of the Change team and how did he become my personal favorite? Just read and find out about this amazing guy. I could talk about how he may be a forerunner to Jetman's Ryu Tendo. Both characters are reliable leaders yet they have their own personal issues to deal with. He tends to put duty above feelings but there are times his feelings gets the best of him. This sort of clashes with Shou (who could be a forerunner to Gai Yuki in some way) though the conflict is more of how to run a mission. Such incidents were like how he chose to still believe in Sayaka Nagisa's anti-gravity belt invention or when he saw an amnesiac Shiima. He stood by Sayaka when everybody else turned against her for her failed anti-gravity belt. He also wanted to believe that Shiima can still be saved even if Shou thought otherwise. This whole factor of him being human and correcting his mistakes may have serve as an inspiration to never give up. My favorite example was when he didn't want to do his Dragon Ball technique anymore because it harmed a close friend of his and he managed to overcome that fear. Perhaps part of the reason why I like him is also his rivalry with Space Pirate Buuba and Commander Giluke. The motorcycle stunts are amazing and the sword work is plain genius. 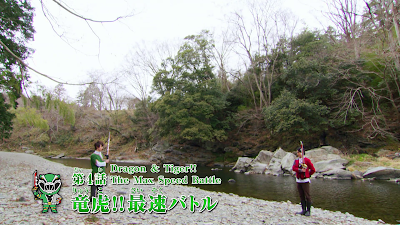 I couldn't forget their first clash with the motorcycle battle and how the two would frequently clash. He also tried to talk sense into his rival Buuba when the latter's lover Jiru showed up. The epic final battle with Buuba was pretty much fun to watch how he delivered the desired warrior's death of the latter. As for Commander Giluke it was also fun how he clashed with the Gozma commander. 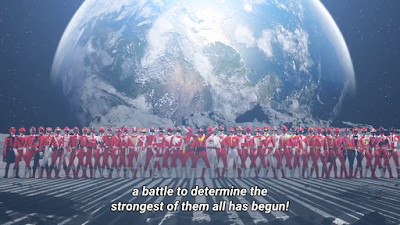 Giluke would later return as Super Giluke and the two would also have more clashes. He freaking delivered a fatal blow to Super Giluke in the finale arc which saved the whole team. How did the rivalries work with his human side? I could talk about how he actually took a blast meant for Gator. He also started seeing Gator as someone who was severely misled by the enemy. He also saw Shiima as someone who's brainwashed and crazy. I couldn't forget the rage he delivered when Buuba "killed" Shiima. 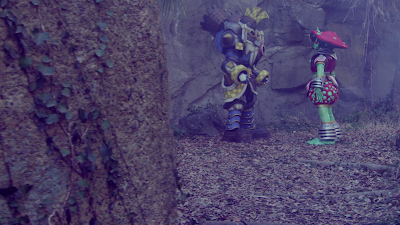 The two ended up in a final scene where he unknowingly helped deliver Buuba from the latter's constant torment. In the end, he paid respect to Buuba's grave marker with flowers. He was also responsible for reconciling Gator with his estranged family. Pretty much, this guy is one badass dragon. He's an all-around goody good hero who can be tough whenever it's needed. Change Dragon is the best of both worlds. Hiroyuki Hamada a JAC thespian and Kazunori Niibori suit actor. Hiryu is a amalgamation of Tsuyoshi Kaijo and Takayuki Hiba. Ryu Tendou was a weak attempt to duplicate Hiryu but the finally got it right with Goro Hoshino!